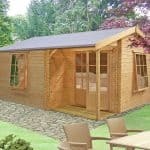 If you’re looking for an attractive and cost effective extension to your home, then it makes sense to look at this stunning and very spacious log cabin from Waltons. 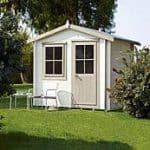 It’s so versatile, thanks to its designs and dimensions, then it can be used for almost anything, from a home office, to a games room or guest quarters. Once inside the stylish veranda opening, there are two distinct rooms, meaning that it can easily be used for multiple purposes. 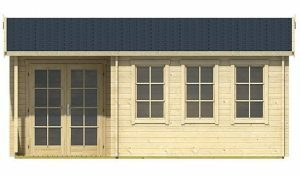 On top of the cabin sits a tall apex roof which helps give this building its very accommodating headroom. 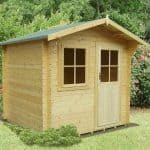 Made of tongue and groove cladding and covered with a thick mineral felt, it shows the attention that’s been paid to quality and durability. 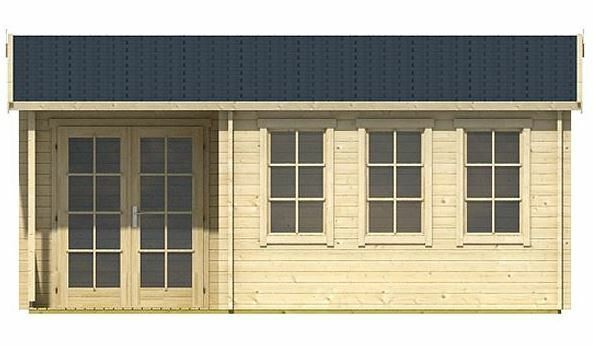 This is also emphasised by the thick logs and supporting framework that give the cabin its strength and stability, as well as ensuring that rain is kept out. With five double glazed windows, light floods into the entirety of the building, and because they can all be opened it’s easy to ventilate during warmer months. It’s just one reason why we found it a very pleasant environment to spend time inside, and with a key operated lock included as standard, security is provided as well. 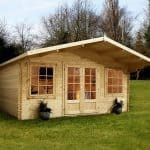 We found this large apex roofed log cabin visually stunning from the moment we saw it, and we feel that it will enhance any garden that it’s situated in. It wasn’t just the sheer size that struck us, although that in itself is very impressive, but we also liked the traditional styling. The veranda entrance area, protected from the elements by the roof, is especially eye catching and adds a touch of luxury as well as providing an ideal space to sit out in and look out over the garden. The apex roof itself should be very durable, and we were pleased to find that the mineral felt used on top of the tongue and groove cladding was very tough. 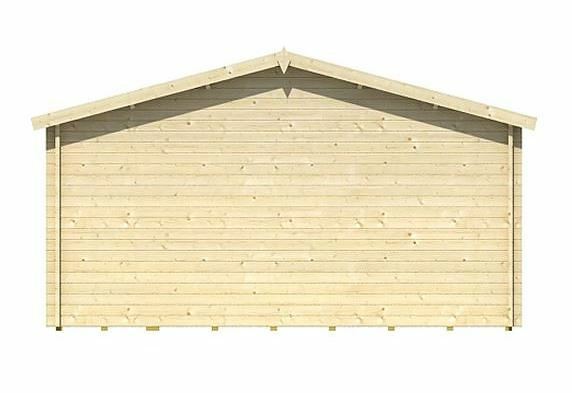 It also provides a lot of height, giving a ridge height of 2.88m with an eaves height of 2.21. 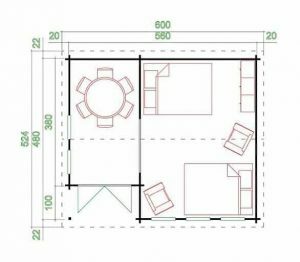 The overall width of the building is 5.60m with a depth of 4.80m, which demonstrates just how much space is available. 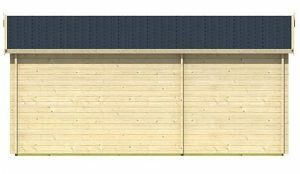 We usually find that log cabins have reassuringly thick cladding, but even so we were impressed with the 44m log thickness used here. Interlocking in a tongue and groove style, it means that there are no gaps for water to find its way through. Further stability, which is always important in a building of this size, is provided by a strong roof joist and chalet connections on the corners. They need only give extra toughness, they also have an attractive appearance. We were also impressed that thick tongue and groove cladding had been used on the floor, its thickness of 19mm matching that of the roof, and that the floor is supported by study floor bearers. This is a very important feature as it means that the timber floor is raised above the level of the ground, protecting it from the high moisture content that’s typically found there. 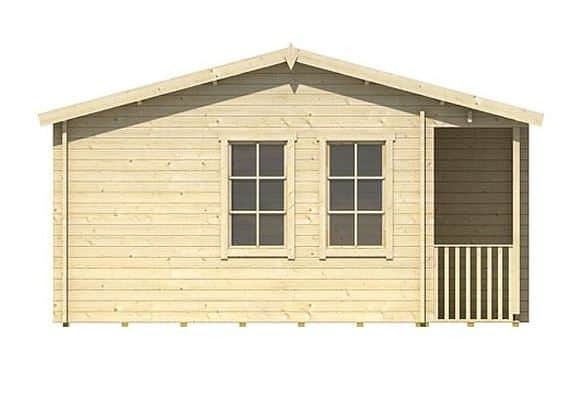 Because the tongue and groove cladding is so effective at stopping water penetration, and because this is also aided by the floor joists and the apex roof, we would expect this to be highly resistant to rot and therefore carry a lengthy guarantee. The manufacturer’s concur, which is they have given a 15 year anti-rot guarantee. It’s as long as any that we see, and will provide real peace of mind for customers. They should note, however, that this is dependent upon them giving the timbers an initial treatment with wood preserver and then repeating this every year. The initial treatment at least could have been rendered redundant if the manufacturer had used an initial preservative treatment prior to shipping, so it was disappointing to see that wasn’t the case. If we were disappointed by the lack of preservative treatment, we certainly weren’t disappointed by the doors and windows. The double doors are strong and also very well sized, with their opening of 1.58m wide and 1.95m tall being amongst the most accommodating that we see. There are five windows strategically positioned so that all areas of the interior are adequately illuminated. We were pleased to find that they were double glazed as this makes them tougher to break, and effectively keeps noise out but heat in. It was also good to find that they are all fully opening, which means that ventilation is as simple as opening a sash. Whilst the double glazing on the windows and on the glazed panels of the doors helps to give some protection against break ins, the best security feature is the mortice lock. Operated by key, it creates a door that not only is secure it looks secure. 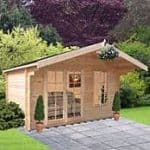 This can be an important deterrent in itself, although we would always urge owners of log cabins to consider adding an alarm system as well. 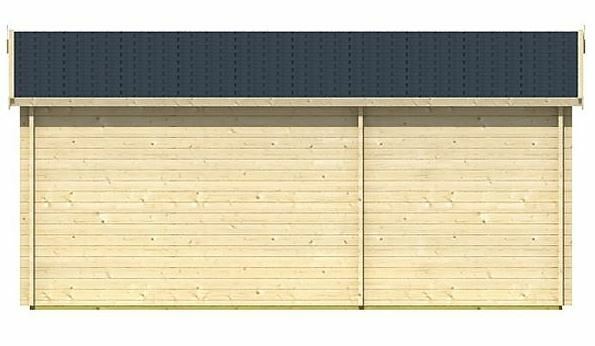 We feel the roof offers a good level of protection against rain, thanks to its winning combination of tongue and groove cladding and mineral felt. This can be enhanced still further by the addition of the optional bitumen coated shingles set. Whilst this enhancement really is optional, one that is absolutely necessary is the purchase of high quality wood preserver. 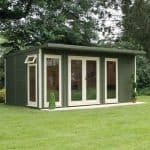 That’s why it was good to see that tubs of Cuprinol Garden Protector, in one of two different colours, can be purchased at the same time as the shed. From the thickness of the logs used in the tongue and groove cladding, to the beautiful and intricate design, it’s clear that there is no compromise on quality throughout. The components themselves should prove very durable if treated at the correct intervals, but it’s a pity that this wasn’t aided by an initial protective treatment from the manufacturer. It was good to see that all the fixtures and fittings were included, and that the assembly instructions themselves were quite clear, but two people will still need to set aside at least a full day to complete the installation. 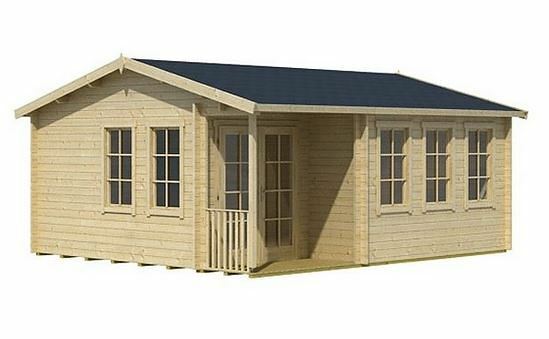 This price may put it out of the range of some potential customers, but if it falls within your budget then it does provide a lot of room and a very stylish design. 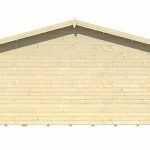 Final Thoughts: Waltons have been making timber buildings for well over a century, and they’ve gained a reputation for elegance and quality. This large log cabin shows why that reputation is well deserved. Yes, we feel that the components should have been pressure treated thus reducing the emphasis on the customer to carry out time consuming yearly retreatments, but other than that it ticks all the right boxes. Both of the interior rooms are spacious in themselves, and thanks to the windows they’re light and airy. 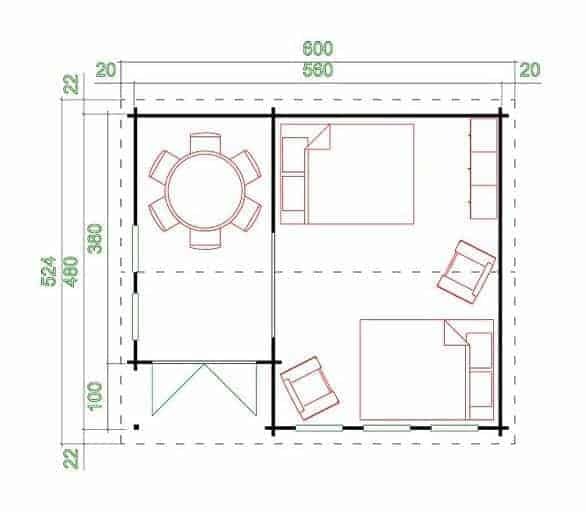 We can imagine one section being used as auxiliary living quarters, and the other as an office or even a workshop.